Order Composite Decking starting from £4.99 per linear meter, with free delivery on all large orders. Including a 10 year exclusive warranty. If you’re looking for a way to transform your outdoor space that will give you the garden of your dreams with little to no maintenance then composite decking is the solution for you. Composite decking is not only stunning and indistinguishable from real wood it also requires little maintenance to keep it looking great and won’t rot, mould or splinter. We are so confident in the quality of our products, our decking also comes with a 10-year warranty, making it the perfect choice for your outdoor renovation. Dino Deckings signature build of recycled wood and plastic offer high-quality weather protection and increased durability. Our composite decking is made of a unique composition of 45% recycled wood, 40% HDPR plastic and 5% additives that not only save these materials from landfill but create a high-quality product with greater longevity and durability than timber wood decking. 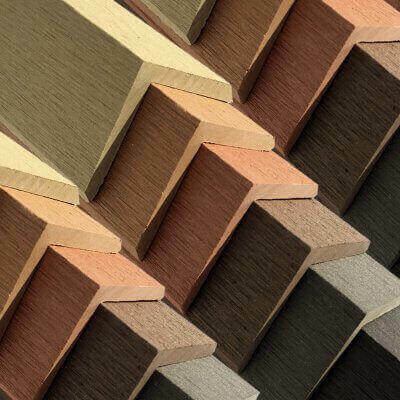 Composite boards available in a range of eight unique colours. 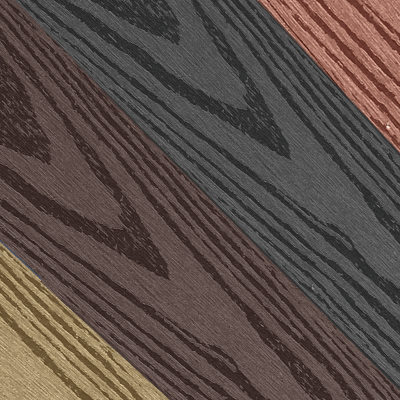 Choose from: Silver, Savanna, Amber, Cedar, Mocha, Ash, Slate and Graphite. The boards are available in 145mm width and plank lengths of 2.4 and 4 meters. Getting your composite decking right can seem like a daunting task. Will the colour match your outdoor furniture? Will it look good with the exterior of your home? And most importantly, as you will be the one enjoying for the next 20 or so years, does the colour match your personal taste? If you can’t decide what colour is right for you, don’t worry, we have you covered. 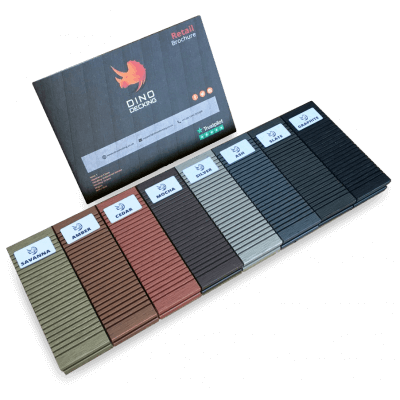 Simply order one of our completely FREE composite decking sample packs which includes a sample of all 8 of the colours our composite boards come in. 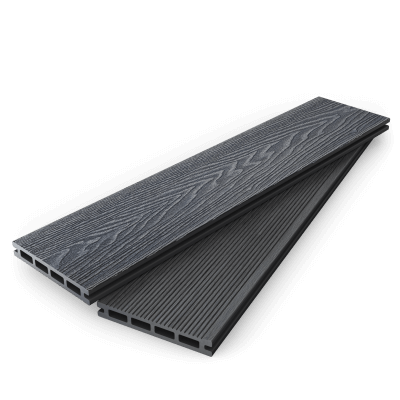 Our composite decking comes with a range of accessories that have been selected for their flexibility and ability to work for a range of projects. Unlike wood decking all our fixings are invisible, hidden in between the composite boards to give a tidier finish. 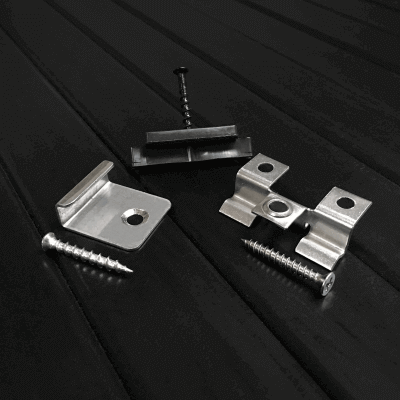 We offer multiple spacing options – 6mm fasteners that offer a smooth finish with no visible screws to 3mm fasteners that provide the ultimate clean finish. Corner trims and Fascia Boards provide that perfect finishing touch to complete your decking. All made from the same composite material as our decking boards to seamlessly match the rest of your decking.